The Riviera Maya, sometimes also referred to as the Mayan Riviera, is the coastal area that runs from world famous vacation destination Cancun to the chic bohemian beach town of Tulum. The Riviera Maya is home to both natural and manmade wonders, from cenotes (natural sinkholes connected by underground rivers and caves), to ancient Mayan ruins, to Xcaret Park, where Mexico’s culture, wildlife, cuisine and natural treasures greet visitors. Did you know that the Riviera Maya is home to various towns and cities, each with its own unique personality? During your next vacation at Hacienda Tres Rios, take a day trip to one of these Riviera Maya towns. Although Cancun is not actually part of the Riviera Maya, it’s where it begins. Cancun is an ideal vacation spot for well, anyone. Fill the day with activities and shopping and then spend the evening at one of Cancun’s huge nightclubs, or just relax on the beach all day and then head to a restaurant for a laid-back dinner. Don’t forget to visit Isla Mujeres, a small tropical island just a few miles off shore, while in Cancun. Puerto Morelos, located about 20 minutes south of Cancun, began as a fishing village, and it has never lost its small town charm. Although there are now large all inclusive resorts located on the outskirts of the downtown area, Puerto Morelos remains quaint and quiet and offers interesting shops and eateries. Visitors can rent a guide and a boat on the beach to visit the Mesoamerican Reef Barrier system, which is right off shore. Playa del Carmen, located about 50 minutes south of Cancun, was originally just the place where you could catch the ferry to the island of Cozumel, however, it has grown into one of Mexico’s most popular vacation destinations. This funky, trendy beach town with a European flair is beloved for its beach clubs and enchanting pedestrian walkway 5th Avenue, with its cafes, restaurants, nightclubs and boutiques. Puerto Aventuras is located a little over an hour south of Cancun. This gated community houses all inclusive resorts, luxury condominiums, a marina, restaurants and shops. Visitors can golf, sail, play tennis, fish, scuba dive, snorkel and even swim with dolphins. Many people like the modern, exclusive feel of Puerto Aventuras. Puerto Aventuras is in a central location in the Riviera Maya and is close to Akumal, Tulum and Playa del Carmen. Akumal is often described as “the turtle town”. Located about 1 hour and 20 minutes south of Cancun, Akumal was originally founded by scuba divers, but is best known for the sea turtles that munch on sea grass in Akumal Bay. Visitors can grab a snorkel and swim with the turtles within a few yards of the beach. (Note: It is important that swimmers never touch or disturb the sea turtles in any way and that they wear biodegradable sunscreen.) Yal-Ku, a natural lagoon located just a few minutes from downtown, is a must see. Akumal is very small, but does feature a few hotels, restaurants and shops. Tulum, recently discovered by New York City fashion society types, has literally been in existence for thousands of years. Tulum consists of three parts, the pueblo; or town where most locals live, the hotel zone; where small boutique and cabaña hotels line the idyllic white sand beaches, and the ancient Mayan ruins site; one of the last cities built and inhabited by the Mayans. 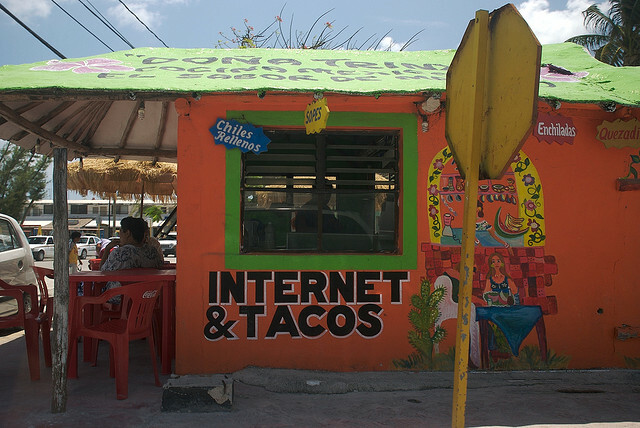 If you stay away from the newer “bougie” spots, it’s easy to fall in love with Tulum. Book your next vacation at Hacienda Tres Rios and visit some of the cities and towns in the Riviera Maya.